The ST ViewScan 4 turns your archives into a more dynamic, accessible and user-friendly resource! This industry leading, 18 megapixel color image sensor brings unmatched scanning capability with the ViewScan 4. 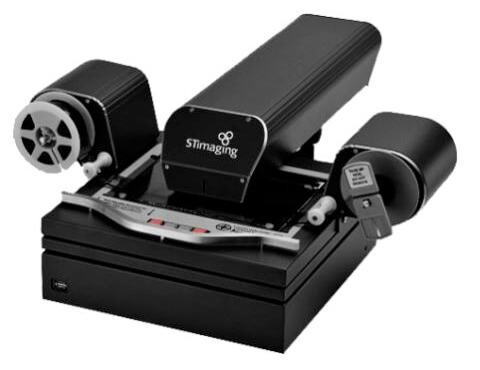 Custom designed by ST Imaging to deliver precise and accurate scans of your micrographics. Easy-to-use software tools allow users more access to their microfilm files and even more ways to share. Easy film loading: The guide rollers make getting started a snap! Simply attach the film, pass under the glass and you’re done! Download the ST ViewScan 4 brochure for more information and hardware specifications. Read more about ST Imaging and how they won their third consecutive Platinum award from LibraryWorks’ third annual Modern Library Awards (MLAs).